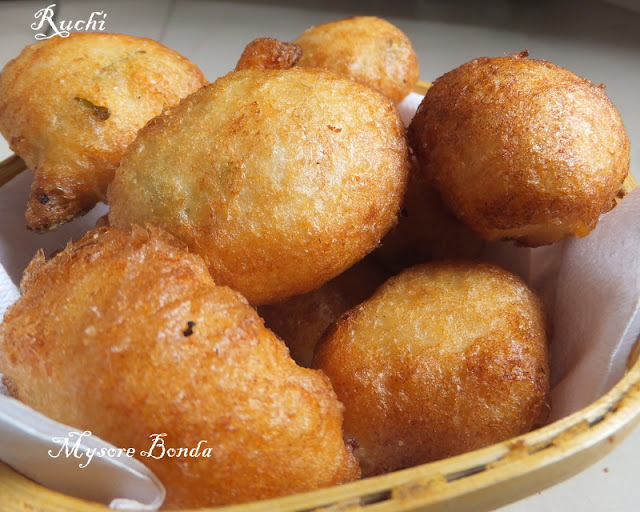 Mysore bonda is scrumptious and a perfect tea time snack. . It is so simple to make and tastes yummy. Here is the simple recipe..
1. Clean, wash and soak the urad dal in enough water for atleast 2 hours. 3.To the urad dal batter add salt, chopped coconut bits, curry leaves, pepper corns, and mix well. 4.Heat oil in kadai and keep a small bowl of water to , wet you fingers to make small desired sized balls. 5.Drop the ball into hot oil carefully and continue with rest of the batter. 6.Lower the flame and Fry the bondas until golden brown in color and make sure inside is cooked well. 7.Drain the bondas on a paper towel. Serve hot Bonda with Coconut chutney. Prefect for the chilled weather's evening snack,love to munch some.